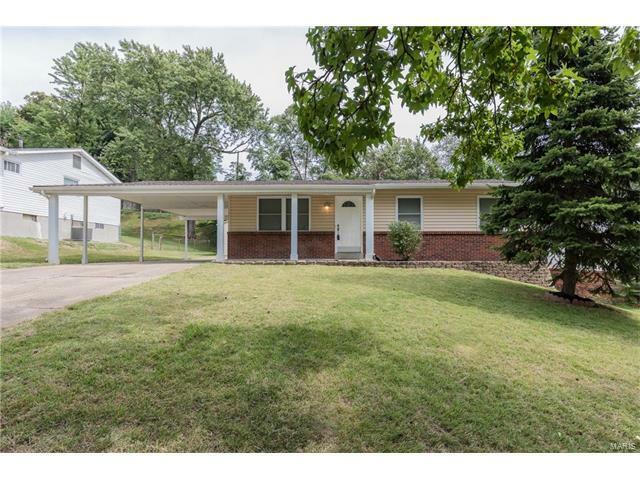 Updated/ upgraded 3 bedroom, 2 bath ranch home. This home is has a spacious kitchen with wood floors, granite counter tops, newer cabinets, can lighting. Bathrooms have been updated. Ceiling fans in each of the bedrooms, with new carpeting and the entire house has been freshly painted. 6 panel doors. Wood floors have been refinished. Roof was replaced 2012, vinyl siding. New A/C coil. Basement has a rough in for future bathroom. Large carport can hold 4 cars and a detached garage with door opener. Nice level yard to relax. Close to all major highways to get where you need to go. Welcome home. Hwy 270 to St. Charles Rock Rd. East to McKelvey, Right to Chaparral. Home is on the left.